As well as donating, there are several other ways you can help us to build a better future for Share's students. Throughout the year, we run a number of events for our students by way of celebration of their time with us or as fundraising events. If you would like to sponsor one of our events, email marcomms@sharecommunity.org.uk or call 020 8701 9821 to discuss the opportunities we have available. We are always happy to hear from anyone who would like to walk, run, swim, bike (or, frankly, do anything else!) to fundraise for Share. Email marcomms@sharecommunity.org.uk or call 020 8701 9821 to discuss your ideas and how we can support you in your fundraising challenge. If you are an employer and can offer our students work experience placements, we very much want to hear from you! Succeeding in the right work placement makes a huge difference for our students. For many, it gives them the extra boost in confidence that they need to successfully apply for permanent work. We welcome work experience opportunities in all kinds of work settings. To discuss your needs, email info@sharecommunity.org.uk or call 020 8701 9815. To leave a lasting legacy, remember us in your Will and help us to help disabled people in the future. We have created a guide to writing and updating your Will, which provides useful information about what you need to consider when writing or updating a Will. 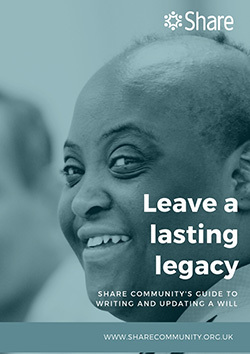 If you’d like to find out more about remembering Share Community in your Will, please contact Share's Chief Executive, in confidence, via email anniem@sharecommunity.org.uk or telephone 020 7801 9817.